Do you understand the language of business? The #1 business skill set you need to learn to have a successful career as a filmmaker is SALES. If you don’t know how to determine the VALUE your videos will bring to your clients lives, you will forever be trading your time for money. 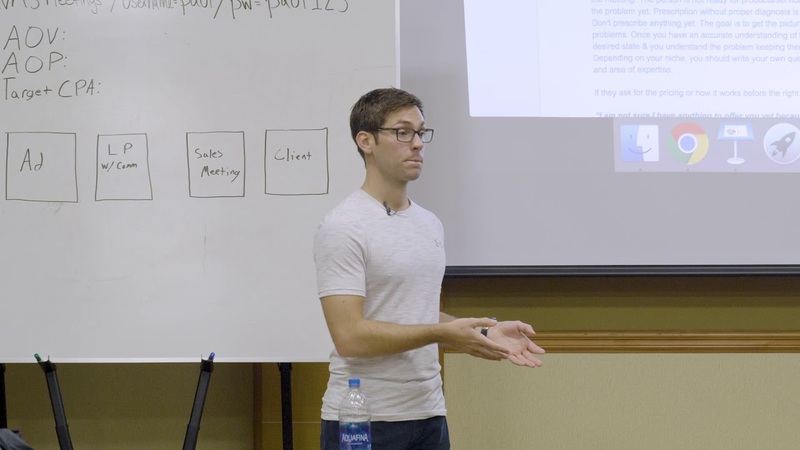 Check out this video on part of the Earn The Deal sales model that positions you as the authority in the meeting and let me know what you think in the comments. – [Student] The last question about how much does it cost to get a new customer? When you said that, just thinking in my business, I don’t know that answer. – Yeah, not a lot of people do, especially freelancers and entrepreneurs. When it’s just the sole person they rarely ever know what they do and may be surprised. A lot of multi-million dollar companies don’t know. They’re really built off word of mouth through referrals, and they’re advertising on billboards and they’re advertising on general advertising on TV, they got no way of tracking things and it’s a really huge problem in the industry that we get to solve. So that’s it we just defined the current situation and you wanna think about the current situation in terms of the creator’s operating system, okay? So in terms of creator’s operating system, marketing, what are you doing, how’s it working, and do you have a predictable system in place, no. Then, sales, do you have a sales mechanism in place for your business or are you basically just saying anything and everything to anybody who comes by? Why is that important? Because if they have a sales mechanism and they don’t have a marketing one that’s an ideal client for us ’cause we can fill the boat in terms of leads and they can convert em really well. If they don’t have a sales thing working or process for it then there’s gonna have to be a, we have to set the expectation they’re gonna have to figure that out, right? From an operation standpoint, is your product good? And I’m gonna ask a question about that. So, how many people have you worked with with this particular product? How, why is it super valuable? Why is it transformational? How is it helping your clients, because if their product isn’t good and I market it, and they sell it, reputation’s gonna get out pretty quickly and ruin my marketing that this product is bad. So that’s extremely important once again. And then in finances, when we get to that point, sort of at the end, so how much are you currently making per month? And we need to know that, and I wanna know typically how much are you making in terms of revenue, and how much are you making in terms of profit? I wanna know those two numbers. And at that point I have a good enough current situation in my mind, and the funny thing is most people haven’t asked these questions of their own business yet, so by the end of just getting through that part of the column they love you. They’re like “I haven’t thought about these things in “forever thank you so much for helping me come to these answers which is really helpful”. Okay, that’s the current situation now. Often times people get this lump in the back of their throat like what if they don’t tell me how much money they’re making, what if they don’t tell me how much profit they’re making, and the way I would always approach that is if you don’t tell me I can’t help you make more. There’s no way for me to help you earn more, make more, get more clients if I don’t know what you’re currently making. Does that make sense? Pretty straight forward.